Only 6 Shoes are hand-made in northern Italy at once. She takes care of details where she includes beautiful ruffles, teftas, SWAROVSKI ELEMENTS, and specially sought after bows. She specializes in bridal shoes, but she also gives us an interesting variety of colors and styles in white, flesh, pink, blue, fuchsia and Tiger prints. About 3 years ago, while I was looking for my wedding show, I drooled over her famous wedges shown below. This, for me is the peak of a classy piece of art! 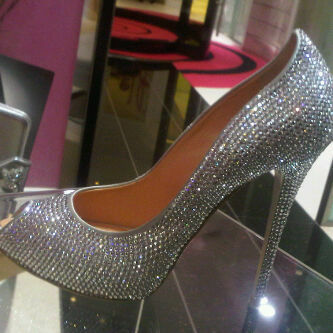 Among the new collection, I absolutely fell in love with a pair of high heels completely covered with SWAROVSKI ELEMENTS. Something in the cut and the general outcome captured my heart. I can imagine myself wearing these anywhere, anytime! Paris Hilton and Kate Hudson among other European royalties and celebreties are some of those who have worn Aruna Seth’s shoes. I usually hesitate purchasing high-end shoes on the Internet and prefer trying them on first. However, for me and for the UAE residents, this problem no longer exists! From now on, Aruna Seth shoes can be exclusively purchased at FROST whose evening and bridal gowns range from Marchesa, Monique Lhuillier and Carolina Herrera. Those brands are among other International ones that were launched for the first time in the UAE by FROST. The most exciting news is that Aruna Seth might be designing the shoes for the bride of most awaited event of the year, the wedding of Kate Middleton and Prince William of Wales. Let’s wait and see! This entry was posted in Aiisha and tagged Aiisha Ramadan, Aruna Seth, Bow, Bridal Shoes, Carolina Herrera, FROST, High Heel, Kate Hudson, Kate Middleton, Lace, Marchesa, Monique Lhuillier, Paris Hilton, Prince William, Royal Wedding, Sophia Bush, Swarovski, SWAROVSKI ELEMENTS, Trunk Show, Wedge by Aiisha. Bookmark the permalink.